Description: School was cancelled in Fremont, so where was I? Sandusky, OH! Caught NS 5214 working a local past the yard at the Amtrak Station. Description: South bound extra train 26W grides it's way up the north slope of Braswell Mountian with three EMD high hood ex Southern GP38-2s as it hammers across Cooch Lake Rd a few miles south of Rockmart Ga. at 4:45pm. Title: NS H65 @ 1054 hrs. Description: NS H65 coming off CNJ bridge for the Washington Sec. at CP PHILLIPSBURG with two short high-nose engines. Description: HM61 works in Abrams with a geep38, a switcher, and-an SD70? The 70 hitched on sometime earlier. Description: HMO1 does some work. Description: Pair of Abrams Yard jockeys cross over the tracks after having finished another run on job HM-01. Description: Awesome! 35A came in with a 9/9W combo. They picked up an NS GP38-2 and-an incredible find-a duo of Reading FP7A's, going on an excursion about two weeks from now. Description: A better view of the duo. Description: 34M passes at 2:41PM with a pair of Reading FP7's in tow. Description: An SD60 and a high hood GP38-2 move about in Enola Yard. Description: One of the switcher sets. They seem to favor SW1500/GP38-2 pairings here at Enola. Description: Yard power at Rutherford Yard include NS GP38-2s 5354 and 5214. Description: The first picture of the day at the Conrail Historical Society's Rail-B-Q, and I was able to grab a shot of blue almost ten years since the demise of Conrail.. Description: Two high-hood GP38-2s shifts a cut of cars at the east end of Enola Yard. 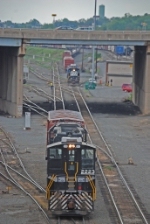 Title: NS 5214 switching yard. Description: A yard job with two high hoods shifts cars around, passing a chopnose GP38 rebuild on 34A. Description: Switching cars around Enola.